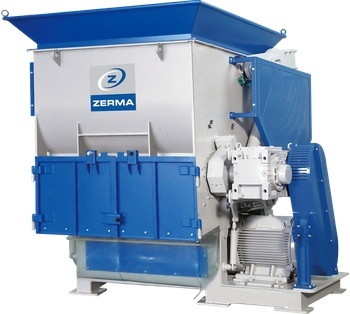 The ZSS series of single shaft shredders are designed to withstand the demands of continuous operation in recycling a wide range of materials including: loose & baled film, purgings, automotive bumper bars, & timber scrap. ZSS shredders feature heavy duty, dual speed hydraulic systems together with integrated PLC controls. The shredder rotor is equipped with special knife holders that secure the square cutter blocks. An efficient cutting design ensures a clean cut & reduces heat build up. Cutting knives may be turned up to four times to utilise the four cutting edges prior to sharpening. Depending on material type & the final size required by the customer, various types of cutters & screens are available. The ZSS shredder can be equipped with various rotor designs. This flexibility of design facilitates processing of all types of materials. The rotors can be modified to suit special applications. The rotors in the ZSS shredder are equipped with square cutter blocks. These cutters make light work of the heaviest application. Importantly, the design allows efficient cutting of material, rather than hammering, which reduces heat built-up & degradation of material. The cutter blocks have four corners so they can be easily rotated when the cutting edge is worn away. In feed & out feed conveyors may be integrated with shredders on request.